Two Justice League teams face off in Justice League #40. When he started his current run on Justice League, writer Christopher Priest said that he’d be approaching DC’s first-tier team book as a workplace drama. The legendary comics writer says that, no surprise, the Dark Knight would be a hero who’d give headaches to the human resources department. Illustrated by Pete Woods with Chris Sotomayor on colors and Willie Schu on letters, this week’s Justice League #40 continues a storyline that finds the public turning on the League. Things had previously started going south when a sleep-deprived Batman made bad calls on a mission that led to a loss of life, followed by a deranged super-fan who began to give the team grief to “make them better.” As internal tensions rose, Batman named Cyborg League chairman. The preview pages of Justice League #40 show the main League and the Justice League of America teaming up to stop a train wreck that’s released toxic gas in an urban center. The infighting gets even worse when the two Leagues’ different approaches clash. 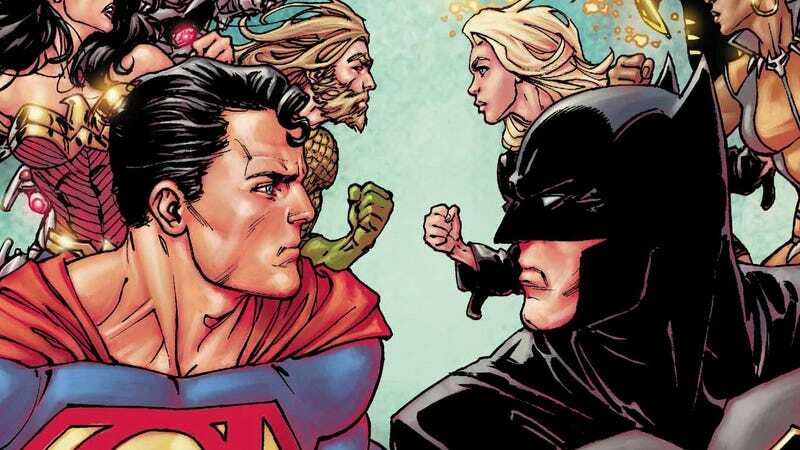 DC will be featuring the Justice League franchise with an upcoming summer event flowing out of consequences of Dark Nights: Metal, and it looks like Priest’s time with the League will soon be over. But he was kind enough to answer questions about his time on the series, with a hint of finality that makes this feel like an exit interview. Justice League #40 is out today. io9: You’ve talked about your run on Justice League as a workplace drama. Which characters see their League membership as a day job or a side hustle? Christopher Priest: Oh, that’s a good question I believe all the Leaguers see the group as an important commitment, but the nature of this franchise concept has been that it is a group of individuals who come from very different circumstances and whose heroic commitments have been borne of very different circumstances. Exploring those differences and resonances is what makes the group so interesting. io9: Who deserves a raise? Or a bigger office? Which League member is an HR nightmare? Priest: Well, Batman would obviously be the nightmare. He tends to set his own hours and create his own procedures, often in ways subversive to the group bylaws and traditions. Aquaman likely deserves the raise because he’s maybe the least flashy of the group. He’s a classic, long-lived DC stalwart and is frequently omitted from the mainstream of thought regarding DC’s “Big Gun” heroes. That’s why I had [Green Lantern] Simon [Baz] omit him when he was whining about the “major” and “minor” Leagues. io9: What makes Cyborg most qualified to be the new League chairman now? Priest: I believe Vic was qualified all along, but he has it worse than even Aquaman. He’s so overshadowed by the big guns and, honestly, not a whole lot has been done with him since they New 52’ed him into the League. But, in Rebirth, he’s a founding member. I personally see him (with the likely exception of Jessica Cruz’s Green Lantern) as the League’s youngest member (although your mileage may vary). Pete Woods certainly draws him that way. I see Cyborg as the smartest kid in class, quietly sitting at the back of the room. The quintessential team player: generous, patient, thoughtful. He knows more, and is more capable, than even he knows. I believe that’s why Bats chose him—on its face it may seem that he made the choice to spite the group, but spite is not in Batman’s character. io9: Are there instances where a character’s function on the team runs counter to their personality? Priest: Wow. Another good question—you’ve stumped the band. The obvious place to start is Superman. If I gave Superman too much rhythm, he’d overshadow the entire group. If his function is to be the backbone of the team, he would, I imagine, tend to restrain himself a little—reign himself in a bit—because he knows he himself does not know everything, does not have all the answers. But the rest of the team has so much respect for him they’d follow if he chose to lead. If Supes said, “No, Cyborg is not ready,” the team would agree—including Cyborg—because Supes really is just that respected. So, fighting my fanboy glee at finally getting my hands on him, I’ve deliberately been a little standoffish with Superman, keeping him largely off-center because he’s such a huge presence. As a character, I see Wonder Woman as a study in contradictions between the philosophy of peace and the realities of having to defend the innocent. “Since I’ve been here,” she said in issue #35, looking at her fists, “all I’ve used are these.” Were my JL run to continue open-ended, I’d have explored those contradictions. She needs the comradeship, she wants to help, but the League can and often is a huge detour away from who she is and what her true mission should be. And, once again, Aquaman, whose life and commitments mirror those of the Black Panther. I feel like I understand him best, while I’ve possibly not served him very well or frankly been as supportive of Dan Abnett’s amazing writing as I should have been. Unfortunately, I was not aware about a lot of the collective DC continuity and, like Panther, I think Aquaman’s League commitment runs counter to the larger moral imperatives of his responsibilities. I’d have explored those contradictions, too. io9: Your whole run has focused on the tension of public accountability for the League. How do you manage to stretch that core idea without the worry of breaking the conventions of the whole superhero genre? Priest: (laughs) I just assume everyone will ignore me. I am always, no kidding, always surprised to discover anyone anywhere is paying attention to something I’ve written or said. I hung out with Tom King and Scott Snyder at Kansas City’s Planet Comicon, and those guys could not possibly have been more generous and gracious considering I really am kicking them both in the shins with this JL run. My overall approach to the superhero genre is reality-based. It started when I was a kid, reading Denny O’Neil’s run on Superman. Denny never wanted to write Superman but got dragooned into it by legendary DC Editor Julius Schwartz, whom I had the distinct pleasure of getting to know. Denny’s approach to Superman was to take a hard look at the mythos and apply realistic, “real-world” circumstances, which evolved the franchise from the Silver Age of Cary Bates and Elliot S. Maggin (comics I cherish to this day) and set Superman on a course ultimately realized by John Byrne’s epic Man of Steel and Dan Jurgens’ seminal, definitive run which included Death of Superman. As a professional, I had the amazing experience of applying that “real world” test to Green Lantern; Denny insisted I read Carl Sagans’ Cosmos and apply more principles of “real” science to that franchise in the pages of Action Comics Weekly and, ultimately, the Emerald Dawn Green Lantern reboot. I took that realism approach to a further extreme in my prose novel, Green Lantern: Sleepers Book Three. Writing a novel gave me a greatly expanded palette with which to explore Hal’s humanism and how it was being challenged, and potentially lost, by this galaxy-spanning fraternity. The novel also features the League and somewhat mirrors my current JL run in tone. Now, not everybody likes their superheroes depicted in that light. I accept that not everybody will like my Justice League which is why God created my friend Steve Orlando (Justice League of America), which holds up the tradition of the larger-than-life challenges to the team. Which character surprised you most when it came time to sit down and figure them out? Priest: Jessica. I just love her. I want to write a Jessica Cruz solo series. I can’t explain it. It’s not even the character so much as Pete Woods’ interpretation of her. The character literally talks to me. And she’s funny and fascinating; a Wonder Woman in the making, a young woman on a journey unburdened by decades of continuity. And she’s hopeful in ways I no longer am, so she cheers me up. She is a blast to write; I wish I had more time to write her. I want to extend much appreciation to Phillipe Briones, Ian Churchill, and Marco Santucci for lending their talent and major investment to this series, and great appreciation to Pete Woods who I want to adopt like a puppy. Amazing work, guys!